According to the Society of Motor Manufacturers and Traders (SMMT) 2,540,617 new cars were sold in 2017, which is an overall annual decrease of 5.7% in comparison to 2016. Despite this the UK’s new car market was still the third largest in a decade at over 2.5 million vehicles sold. The RAC Foundation recently reported that were 38.2 million licensed vehicles in the UK, at the end of June 2018. Of which 31.5 million were cars, showing an increase of 1 per cent compared to this time last year. As a result, Click4reg decided to investigate further, how the UK ranks in comparison to the rest of Europe for the number of brand-new car sales conducted in 2018 so far. The data was extracted from the European Automotive Manufacturers Association (ACEA) and it represents the figures for the number of brand-new cars that were purchased between January and August of this year. It comes as no surprise that Germany is found at top with a staggering 2,473,284, followed by the United Kingdom (1,571,986), France (1,513,932), Italy (1,365,947) and finally Spain (973,542). Despite the UK having the second largest number of new car sales, it has experienced a 4.2% decrease in sales in comparison to January to August back in 2017. The Czech Republic (193,252), Portugal (169,827), Denmark (157,969), Ireland (119,929) and Romania (100,824). Bulgaria (23,685), Lithuania (22,049), Estonia (18,982), Latvia (12,080) and lastly with the fewest new car sales is Cyprus with 9,508. Romania (47.5%), Lithuania (32.2%), Hungary (31%), Greece (23.9%) and Croatia (22.6%). 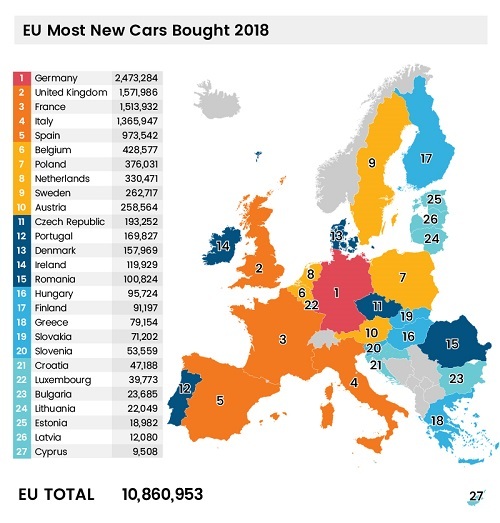 Interestingly, the data revealed that the European Union has sold 10,860,953 brand-new cars so far in 2018. Which is a 6.2% increase from the number of new cars that were sold this time last year (10,231,626).